Alison Rankin’s intense and jewel-like still life paintings are much inspired by her past career as a designer and stylist and her love of antique china, domestic items and fabrics. These, along with fruit or vegetables, are painted faithfully, creating a sensuous and classic still life feel. Textures, shapes and colours are harmoniously combined to elevate the mere domestic to iconic status. Starting in Autumn 2005 Alison has been producing a range of more contemporary paintings. 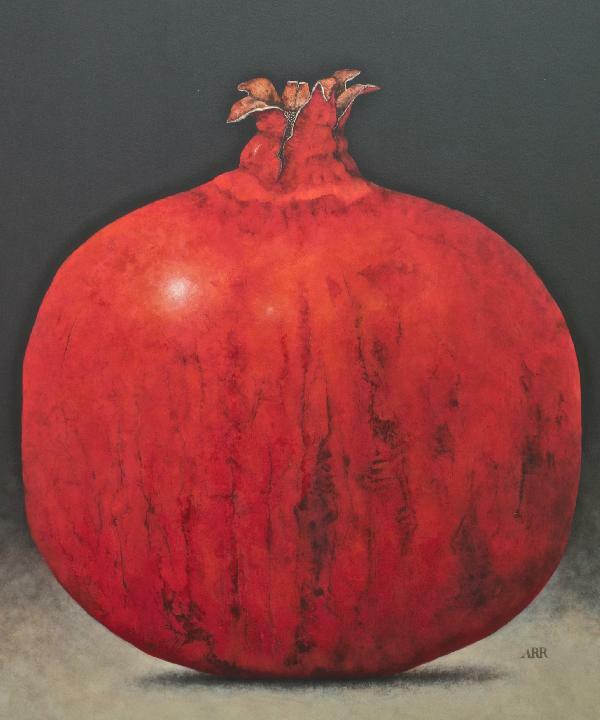 Mainly of oversized single fruits, particularly pomegranates, on a simple plain background. These are framed simply in black box frames and are in various sizes, lending themselves to group arrangements of three or four. Worked in acrylics on board or thick Fabriano paper, with a great emphasis on colour and composition, her paintings are exhibited and collected widely.